The Bushehr plant is expected to produce 1,000 megawatts of electricity once all the fuel rods are in place. (CNN) -- An Iranian nuclear energy plant could be weeks away from producing electricity for the country's national grid, national media outlets reported Saturday. Ali Akbar Salehi, the head of the Atomic Energy Organization of Iran, said the fueling of the plant in the southern city of Bushehr is complete and that officials are hoping that the facility "will hook up with the national grid in one or two months." "All fuel assemblies have been loaded into the core of the reactor" and "all we have to do is wait for the water inside the reactor's core to warm gradually, and carry out another series of tests," the semi-official Fars News Agency quoted Salehi as saying. The news comes amid persistent consternation among the United States and other international powers over Iran's nuclear program. They suspect Iran is developing nuclear power for military purposes, a claim Iran has denied. Talks in Europe over Iran's nuclear program are scheduled to resume December 5. Iran has been under stiff sanctions over its continuation of uranium enrichment. Iran will be meeting with the so-called P5 plus 1 countries -- Germany and the five U.N. Security Council permanent members: the United States, France, Britain, China and Russia. Secretary of State Hillary Clinton has said the United States has no problem with the Bushehr plant, but she is concerned about "places like Natanz and their secret facility at Qom and other places where we believe they are conducting their weapons program." The Bushehr plant is expected to produce 1,000 megawatts of electricity once all the fuel rods are in place in the core of the reactor. The construction of the Bushehr plant, on the coast of the Persian Gulf, started in 1975 when Germany signed a contract with Iran. Germany, however, pulled out of the project after the 1979 Islamic Revolution. 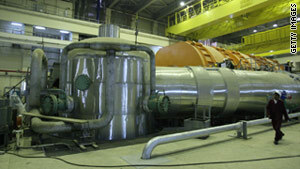 Iran then signed a deal with Russia in 1995, under which the plant was scheduled to be completed in 1999, but the project was repeatedly delayed. The fuel for the plant has been provided by Russia. Under an earlier agreement, Iran is set to send the spent fuel rods to Russia.